Have Lex wait on the marked spot (near the centre of the map). If he has an Iron Axe in his inventory, a mysterious woman will appear and give him the Hero Axe. After Hierhein is conquered, have a male character wait adjacent to the neutral Mackily soldier, which is blocking passage to Mackily via the mountain path directly north of Evans castle, for a minor conversation to occur. 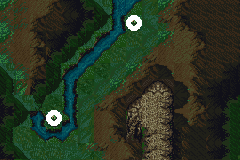 Have Arden wait near the marked spot (towards the west of the map). If he doesn’t have a lover, he will find the Pursuit Ring. Have Dew wait right in front of Blaggi Tower and he will obtain the Wind Sword. Before Thove is conquered, and if neither of Levin, Sylvia or Fury have a lover, a special conversation occurs if you make Sylvia wait next to Fury. This gives a boost to Levin and Sylvia’s love points and a smaller boost to Levin and Fury’s love points. 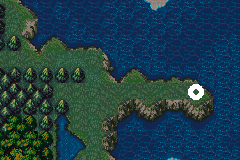 If Sylvia visits one of the villages towards the north of the map, Sylvia will offer to dance for the villagers. At the end she will obtain the Defender sword. Often the game freezes during Sylvia’s dance. If this occurs, save your game before visiting the village. If the game freezes, reset and load the game, and then visit the village again. Have Arden wait near the marked spot. If he has a lover, his Skill will rise by 5 points. Have Celice visit the village directly north west of Isaac, and a different conversation will occur. Before Ganeshire has been conquered, Lester or Delmud (or their substitutes) can talk to the neutral Sophara soldiers. Before Ganeshire has been conquered, Lester or Delmud (or their substitutes) can talk to the neutral Isaac soldiers. If Dimna enter Isaac castle, a conversation will occur with an old friend and his Strength will rise by 5 points. If Johalva or Johan wait next to Radney more than 10 times, a conversation will occur and Radney’s Strength will rise by 2 points, and Luck by 3 points. If Laylea visits one of the villages, south of Lenster, Anna will appear and give her the Barrier sword. After Blume is defeated, have Daisy wait next to Shanan. A conversation will occur and Daisy’s Skill and Speed will rise by 3 points each. 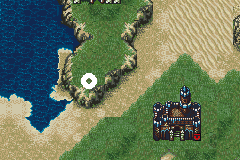 After Melgan is conquered, and both Tristan and Roddlevan are below Level 10, have Tristan wait next to Roddlevan. A conversation will occur and Roddlevan’s Strength will rise by 2 points, Skill by 1 point and Defence by 1 point, and Tristan’s Strength will rise by 2 points, Speed by 1 point and Defence by 1 point. If Fee waits on a special spot in the mountain peaks directly south east from Alster, a conversation will occur where Fee talks to her Pegasus. If Linda waits at the bottom left marked spot, she will meet Jake and her Magic Defence will rise by 3 points. If Amid waits at the other marked spot, he will also meet Jake and his Magic Defence will rise by 3 points. If Asaello visits the village, directly north west of Conote, a conversation will occur and his Strength will rise by 3 points. If all the characters in the Second Generation survived, and after Conote has been conquered, have Celice wait next to Mana. A conversation will occur and Mana’s Luck will rise by 5 points. The conversation will not occur if either Celice or Mana already have a lover. If Hawk enters Luthecia, a conversation with a youth will occur and Hawk’s Magic and Magic Defence will rise by 3 points each. After Grutia is conquered, have Sharlow wait next to Hannibal. A conversation will occur and Sharlow will obtain the Berserk staff. If Femina or Janne visits one of the villages, towards the north west of the map, a conversation with a fake Shanan (Shanam?) will occur and Femina or Janne’s Defence will rise by 3 points. 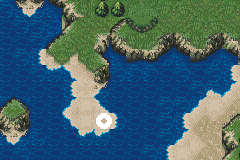 If Celice waits adjacent to a water tile, and after Alvis has been defeated, a conversation with the ghosts of Celice’s parents will occur. Celice will then receive the Life Ring.